Akiles Products Inc. a leading manufacturer for the bindery industry. They were founded on the standard to provide excellent and consistent quality products at a reasonable and competitive price. The Akiles Finish-@-Coil (Finish a Coil) series of plastic coil spiral binding inserting machines are some of the most popular coil inserters for consumers of all sizes; from small offices to printers. The series includes the Finish-@-Coil-M and the Finish-@-Coil-E1. In this article we will compare and contrast these two spiral binding inserting machines so that you can make the right choice for your particular needs. Both coil inserters feature electric coil inserting action to speed production. The main difference between the Finish A Coil M and E1 is the cutting and crimping feature; the "M" manual machine features manual cutter-crimper pliers to cut and crimp the spiral binding by hand, whereas the "E1" electric machine features a 1-sided electric coil cutter and crimper. With its adjustable full-size rollers, the Akiles Finish-A-Coil M heavy-duty electric spiral binding coil inserter makes spiral coil inserting surprisingly fast and easy, even on the extra-large diameter sizes. This machine is ideal for operators that demand versatility & productivity... and it is a must have for all binding centers with medium workloads. The Akiles Finish-@-Coil is a great option for anyone binding low to medium volume books from 6mm (1/4") up to 50mm (2") using spiral binding. It is foot pedal operated so it conserves energy, keeps the noise level to a minimum, and leaves both hands free. 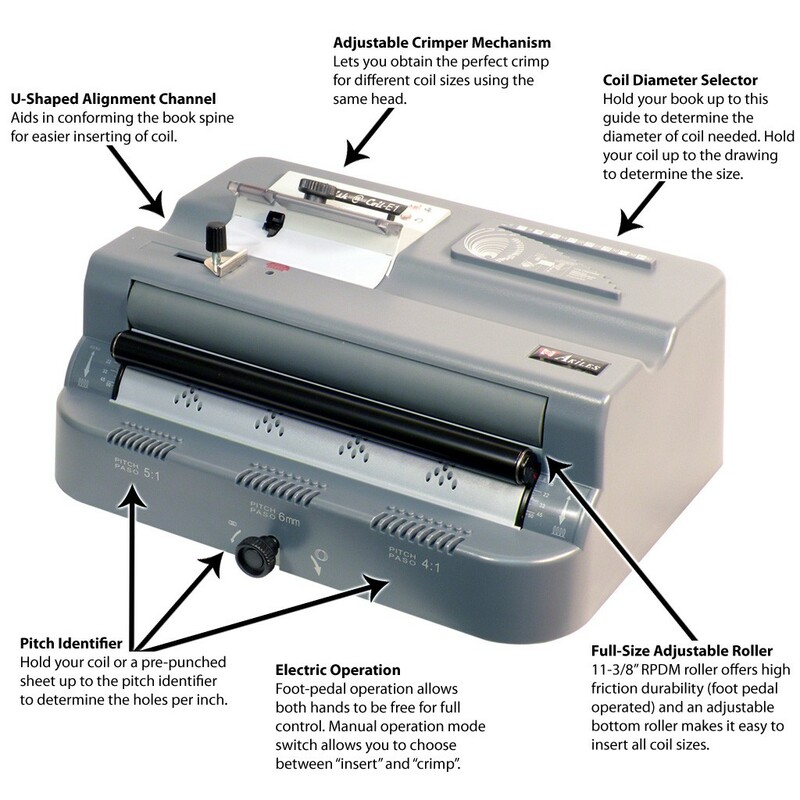 A diameter guide is printed on the machine so you can determine how to set the roller. It measures 10” x 14.5” x 7” and weighs about 17 pounds. 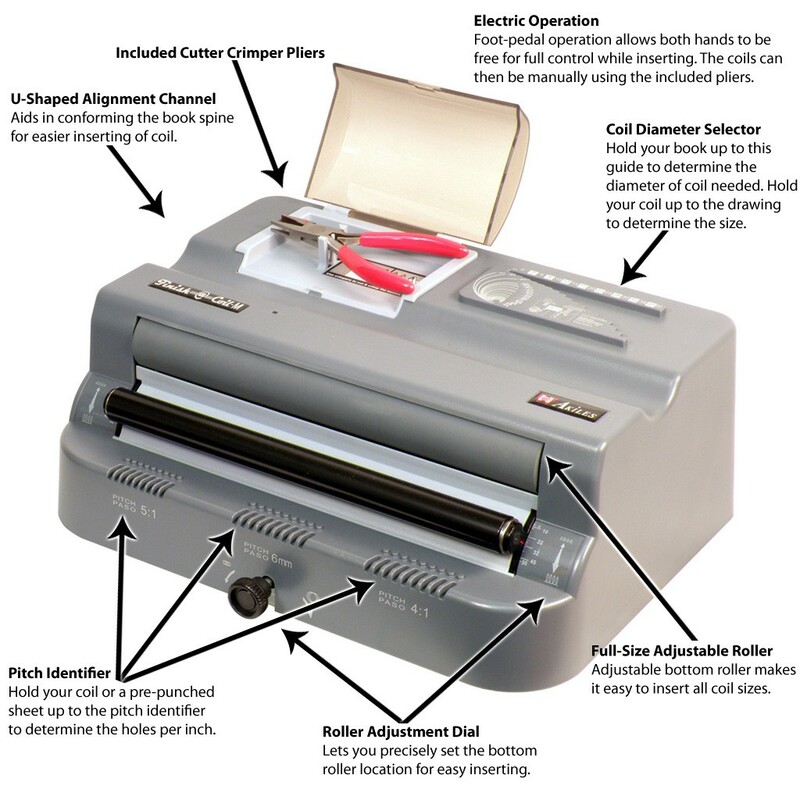 The Akiles Finish-A-Coil E1 electric spiral binding coil inserter with built in electric cutter and crimper will be the easiest-to-use spiral binding finisher that you can find on the market today. It is designed with one goal in mind... providing the maximum productivity & best results while requiring minimum efforts from the operator. With its adjustable full-size rollers, this high-capacity electric coil inserter makes spiral coil inserting extremely fast and easy, even on the extra-large diameter sizes. Furthermore, the built-in electric spiral coil crimper will make your coil binding experience easier and faster than ever. Forget about using the cumbersome manual coil crimper that tires your wrist. With the Finish-@-Coil E1, you will easily & quickly crimp off the excess coil in your book with a simple press of foot pedal. The Akiles Finish-@-Coil E1 is ideal for operators that demand maximum productivity & the best binding results, with minimum efforts. The Akiles Finish-@-Coil-E1 is a great option for anyone binding medium to high volume books from 6mm (1/4") up to 50mm (2") using spiral binding. It is foot pedal operated so it conserves energy, keeps the noise level to a minimum, and leaves both hands free.